Cryptocurrency is going legit in a big way. Leading U.S.-based cryptocurrency exchange Coinbase is going after institutional investors with four new major products, all of which cater to the needs of professionals and big institutions, making it easier for them to trade cryptocurrencies such as Bitcoin, Ethereum and Ripple. The new products address many of the issues that big investors such as hedge funds face when trying to enter the cryptocurrency market, providing liquidity, safe storage of assets, quality support and advanced products such as OTC (over-the-counter) and margin trading. If institutional investors take the bait — and judging by announcements from banking giants such as Goldman Sachs, they will — Coinbase’s new tools will clear the path for an even larger outpouring of money into cryptocurrencies. Coinbase Prime is a platform with all the bells and whistles institutional investors are used to, and by the end of the year it should have advanced tools such as margin trading, algorithmic orders and multi-user permissions. Note that individual investors should use Coinbase’s trading platform GDAX; Prime is for institutions and professionals only. 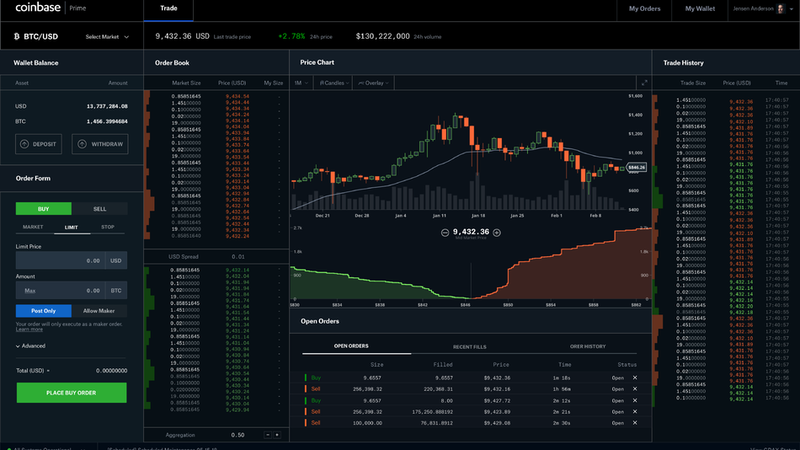 Coinbase Markets is a centralized liquidity pool for all Coinbase products, which, besides Coinbase’s digital wallet and exchange, include trading platform GDAX and now Prime. This product will be headquartered in Coinbase’s new office in Chicago. Finally, the Coinbase Institutional Coverage Group will work from Coinbase’s New York City office to provide support to clients including research and market operations. This is a major upgrade to Coinbase’s product lineup, which has so far been mostly oriented toward individual investors. “There is clear demand from institutional clients and financial services professionals for more specific solutions with regard to cryptocurrencies that address their sophisticated needs,” Adam White, Vice President and General Manager of Coinbase Institutional, said in a statement. Coinbase claims that more than 100 hedge funds announced plans to trade/invest in cryptocurrency in the last few months alone. Coinbase was reportedly adding more than 100,000 users per day in late 2017, when the cryptocurrency craze — and Bitcoin price levels — was going off the charts. The company reportedly had more than $1 billion in revenue in 2017, and valued itself at $8 billion in April 2018.